Roger de Gaignières Tarot (dit de Charles VI). 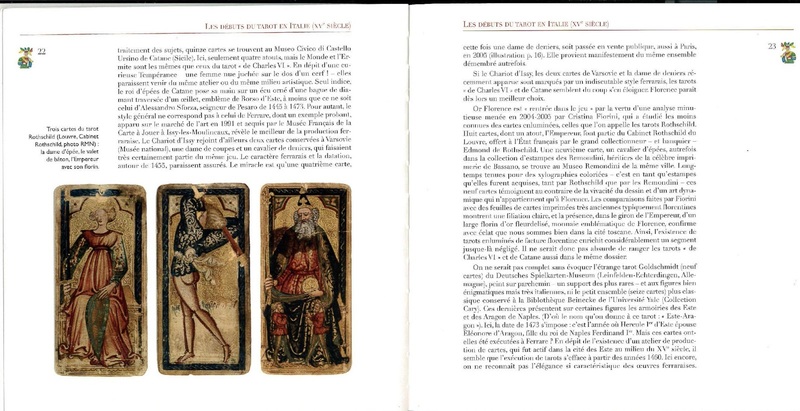 From then on, simply le Tarot de Gaignières (of if preferred, as being established, then Tarot dit de Charles VI)"
Yes. That's going to be progression to abridge it - once a consensus reached on the complete name. The question is : what dénomination can be given to the game? Chevre : she goes your way and I suppose Bertrand will also! "pour ma part, OK pour Tarot de Gaignières dit "de Charles VI", je trouve élégant de rendre hommage au grand collectionneur grâce auquel nous connaissons tous ces trésors. Même si, d'un autre côté, j'ai vaguement l'impression que Tarot dit "de Charles VI" suffirait... et simplifierait les comptes rendus. Quoique les abréviations sont aussi là pour ça...?! ("TG Ch VI" ?)" I understand as you that it is a game of Trionfi later on called Tarot. But in my mind, the word TAROT does appear in only 1505 with taraux and tarocchi. In the TG Ch VI, we have 16 Trionfi. Now, a wild hypothesis absurd : what if they were 22 and not 16? Then I would have considered that we would have been in front of the first TAROT without it's later name! Maybe is it a Trionfi / Chess? The TdChVI is very definitely not a pseudo-tarot. It is a real tarot, even if we don't know how many triumphs it had. 16 is enough, and if there is one suit card then there were surely more (Huck might disagree, I don't know). Tarot was a card game played before it was called "tarot" and "tarocchi", just as Madame de Gaulle had a life before she married the General (who may not even have had that title). Likewise we have the so-called Charles VI tarot (or "tarots", in French), of probably before 1465, then called triumphs. The "then called triumphs" is only necessary if there is confusion. Nor is it pseudo-Charles VI. The convention about "pseudo" followed by someone's name is that it is used to indicate that the author or editor was not actually the one to which the work has been conventionally attributed. So pseudo-Dionysius, pseudo-Iamblicus, pseudo-Aristotle, etc. But Charles VI was never seen as the author or artist of that deck. Calling the deck in question the "tarot de Gaignières" follows the principle of designating a tarot by its principal collector. But we don't always follow that principle, at least on THF: the "Marseille" tarot was not collected by someone named Marseille. The Cary-Yale was not collected by Cary-Yale, etc. 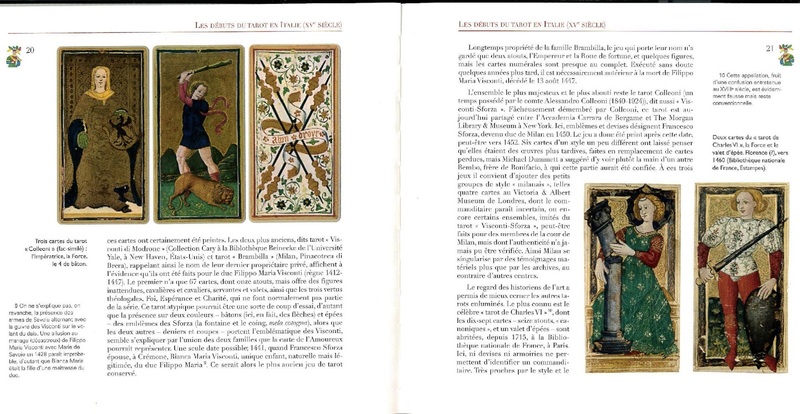 Moreover "tarot de Gaignières" is rather obscure, unless you explain it in detail. Either seems fine to me; nor is it necessary to be consistent. It seems to me that "dit" in French sometimes is used, with or without the quotation marks. In English that would be "so-called". Personally, I am against "tarot Gaignières" or "tarot de Gaignières" because "Gaignières" is obscure and the deck already has a name which those who know it has nothing to do with Charles VI continue to call it. As far as abbreviations, it does not matter much, as long as it is made clear in the text what it is an abbreviation for, preferably in parentheses or brackets immediately after the first use. But "TdG" or "TdeG ChVI" both have the problem that the passages in which they occur then are quoted by others in isolation from the previous reference. That then obliges the person doing the quoting to put an explanation for the "G" in brackets, or as part of an introduction. Even in the same work, if the abbreviation appears at some distance from the unabbreviated version, an explanation is required, i.e. the longer version in parentheses. Abbreviations have to be readily recognizable out of context. So one would have to say, in a quotation "...TdG [i.e. tarot de Gaignières, le premier collectionneur, également appelé le tarot dit de Charles VI]", at least the first time. The same would be necessary in any longer abbreviation with the letter G included. Also, if the primary language of the one doing the quoting is not French, it is likely that the one doing the quoting, in the explanation, will leave off the accent grave. It is a bother, especially for one not accustomed to accent marks, to include them. Then error is introduced. So I don't like "Gaignières", or its abbreviation, "G". For abbreviations, I would recommend doing what we do for the Tarot de Marseille. In both English and French writing, the usual abbreviation is "Tarot de Marseille", without any quotation marks around either "Tarot de Marseille" or "M" alone (since we have no idea where the Tarot de Marseille originated). So: TdeChVI. Or more briefly: ChVI or CHVI. Whatever is used, it should be put in parentheses or brackets after the full name the first time it is used in a document (even if I didn't at the beginning of this post). For abbreviations, I would recommend doing what we do, or at least thought we did, for the Tarot de Marseille. In both English and French writing, the usual abbreviation is "T" followed immediately by "d" and then "M", without any quotation marks around either the whole three letter combination or "M" alone (since we have no idea where the Tarot de Marseille originated). So, for the "Charles VI" tarot: TdChVI. Or more briefly: ChVI or CHVI. Whatever is used, it should be put in parentheses or brackets after the full name the first time it is used in a document (even if I didn't at the beginning of this post). I am not quite sure I follow you here -- what is absurd about a tarot having 22 (or 21+0) prior to the name Tarot? I don't find the possibility of there having originally been 22 or 21 trumps +0 wild or absurd, on the contrary, I think it highly probable! And why would it have been 'the first'? What about the other partial/incomplete 15th century decks? "Now, a wild hypothesis absurd : what if they were 22 and not 16? Then I would have considered that we would have been in front of the first TAROT without it's later name!" I was refereing to the ChVI 16 Trionfi - if we had had 22 allegorucal figures. Answer : so do I. "What Mr. Hurst considers incidental, the Number, and as essential, the Image, is not important here - even if Hurst's belief in the primacy of Signified (Image) over Signifying (the Number) raises subjectivity over objectivity: how else to account for the sequence 22 when it comes to the poems of Boiardo or the 22 Figures of the Sola Busca?" If the Ch VI had had 22 allegorical figures and if it'sdatation is prior 1465, in my mid, it would have been the first tarot in datation - prior to Sola Busca (1496?) for example. Now, about the partial/incomplete 15th century decks, in my mind, they are Trionfi later called Tarot. with an explanative note mentionning Gaignières. There is a consensus (apart me) to call Tarot if there is one suit card not knowing how many triumphs there was - even if the <ord Tarot comes later on. I would have reserved the Tarot designation to any 22 allegorical suit...But I am alone on this take. So let's forget it. Final agreement to remove "pseudo" and "?". with an explanation mentionning Gaignières as collectionnor.
. Il est fort probable que Lyster désigne ainsi le jeu de cartes dit de Charles VI, aujourd'hui conservé au département des estampes (réserve Kh, 4), qui provient de Gaignières, et qui est inscrit sur l'inventaire sous le n" 5634. At an early age, François Roger began to make a collection of original materials for history generally, and, in particular, for that of the French church and court. He soon was at the center of a group of art connoisseurs and historians that stretched from Paris to the court of the Grand Duke of Tuscany in Florence. So for information , here is the definitive I hope version about the Charles VI. Non seulement SPQ mais je note qu'il chemine sous une lueur lunaire ...allusion à la Lune du TdChVI? C'est la même "phase lunaire"! Belle coïncidence graphiquement au moins! L'hypothèse du TdChVI lié à Sixtus IV et à la conjuration des Pazzi a aussi été défendue avec opiniatreté par Phaeded sur THF. Ce qui m'interesse dans cette piste est le fait méconnu sinon carrément inconnu jusqu'à maintenant que le Chef de la Conjuration n'est autre que Jacques de PAZZI comme je l ai démontré sur THF . Cela nous ramènerait à Avignon. Investigating further, Alain finds "SPQR" in Florentine drawings as well as one attributed to Nicoletto da Modena, c. 1507, that also has "FAMA VOLAT". To see them, along with descriptions in French by Giselle Lambert, you open http://books.openedition.org/editionsbn ... query=SPQR, click on the place names, four of which are "Florence", and find "SPQR" on the page. Nicoletto's style is rather similar to that of the Sola-Busca, in his case seemingly inspired by the discovery in Rome of Nero's "golden room", with its fascination on the walls for the grotesque.